The Race Track Business Conference has awarded the Charlotte Motor Speedway the “Outstanding Facility of the Year” award. The plaque was presented by National Speedway Directory and Track Guide at the Performance Racing Industry Trade Show. 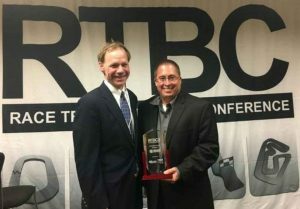 “We are honored to receive the Outstanding Facility of the Year award. The entire Charlotte Motor Speedway team works hard to offer a wide variety of venues for the fans and racers to enjoy and participate,” said Shaun Johnson, Executive Director of Operations at Charlotte Motor Speedway. “Charlotte Motor Speedway has been a long time leader in motorsports facility development. Offering a wide choice of racing circuits with varied surfaces and configurations has created one of the most utilized venues in the world. ” said Tim Frost the organizer of the event. The previous award winners were the Indianapolis Motor Speedway – 2013, NCM Motorsports Park – 2014, Daytona Motor Speedway – 2015. Charlotte Motor Speedway (www.charlottemotorspeedway.com) – Charlotte Motor Speedway (CMS) is a multi-purpose facility featuring seven venues. The main track is a 1.5-mile banked, lighted, asphalt quad-oval facility, with significant club-style seating offering convenient access to premium restaurant-quality food and beverage service, and 52 condominiums overlooking turn one. CMS has one of the world’s largest high-definition video boards, and a modern media center with leading-edge technology infrastructure and access. CMS also has an executive office tower adjoining the main grandstand, featuring The Speedway Club at CMS which offers exclusive dining and entertainment and premium restaurant, catering and corporate meeting facilities. CMS also owns and operates the zMAX Dragway, a unique, lighted “four lane” racing configuration, with almost 30,000 premium permanent seats, 31 luxury suites and upscale food and beverage concession areas. CMS also has a 4/10-mile, modern, lighted, dirt track facility, several lighted “short” tracks (a 1/5-mile asphalt oval, a 1/4-mile asphalt oval and a 1/5-mile dirt oval), and a new 2.25-mile asphalt road course. The facility is located in Concord, North Carolina on 1,310 acres.